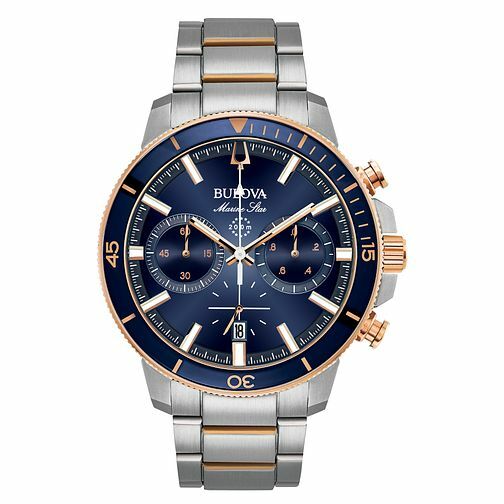 Fear the water no longer with this stainless steel chronograph watch from Bulova. With a deep navy blue dial and rotating bezel, the markers are defined with luxurious rose gold tone accents and a date aperture at the 6 o'clock mark for added precision. Featuring up to 200 metres of water resistance, the Marine Star collection is much more resistant to water compared to other models, perfect for those who are not afraid of diving deep. Bulova Men's Marine Star Blue & Rose Gold Tone Watch is rated 5.0 out of 5 by 1. Rated 5 out of 5 by Anonymous from Exquisite, a very handsome timepiece Bought as a birthday gift and rendered the recipient speechless for all the right reasons. Visually stunning, attractive as a jewellery piece but also proving practical as used whilst diving.